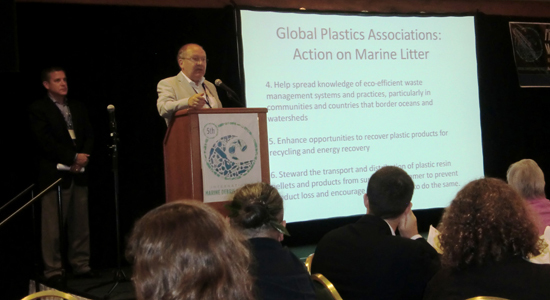 On December 11, the world’s leading plastics associations jointly released a Progress Report on the Global Declaration of the Plastics Associations for Solutions on Marine Litter originally announced in March 2011 at the 5th International Marine Debris Conference. Up to now, more than 140 projects to prevent marine litter were completed, underway or planned, a substantial and significant increase from the 100 projects announced in Dubai in November 2011. The projects vary widely, from education to global research and eco-efficient waste management and litter prevention. In addition, the Progress Report provides case studies and detailed insights into preventing marine litter that can be expanded in other regions. “The plastics industry is firmly committed to the principle that plastics do not belong in the world’s oceans and should not be littered – plastics should be responsibly used, reused, recycled and finally recovered for their energy value. I’m pleased that actions taken in 2012 and planned for 2013 greatly exceed our commitments from Nov 2011,” said Steve Russell, Vice President, Plastics, at the American Chemistry Council. “This report reflects the determination of our industry to shape solutions in partnerships with others,” said Wilfred Haensel, Executive Director of Plastics Europe. “The Canadian Plastics Industry Association (CPIA) is pleased to be a signatory to the Global Declaration for Solutions on Marine Litter and is committed to continue efforts here in Canada to reduce marine litter,” said Carol Hochu, President and CEO, CPIA. Participation of The Declaration includes 58 plastics organizations from 34 countries.